With a lower teen birth rate and delayed marriages, this naturally leads to women having children later in life as this week’s article on Bloomberg.com discusses. 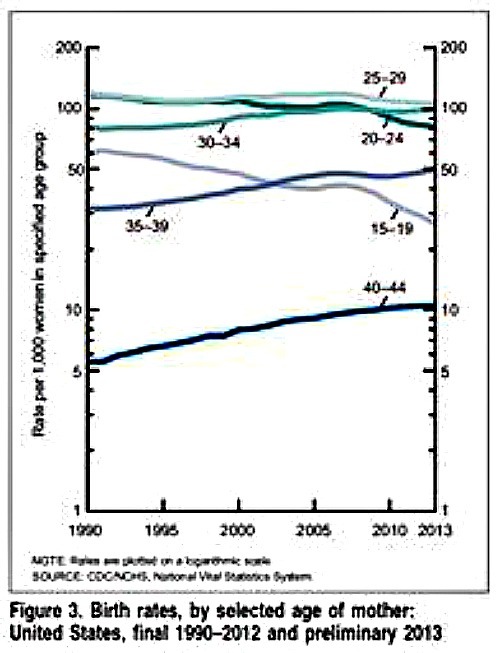 The following chart from The Center for Disease Control shows how birth rates have been rising for older women and dropping for younger ones. There are a lot of spillover effects from having kids later in life according to research cited in the article. The children of those women also benefit, Sawhill found. Preventing unexpected births lifts a child’s lifetime income by $52,000, according to Brookings’ study released yesterday. 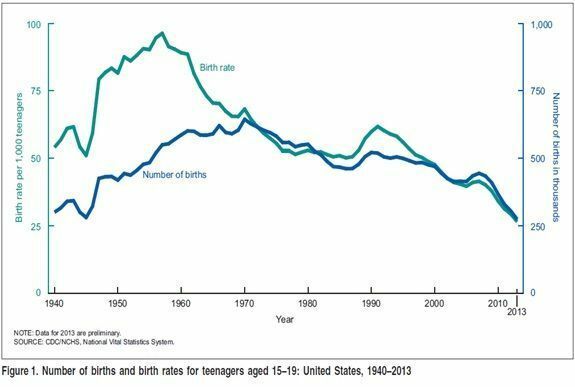 College and high school graduation rates both increase, while the chances of the child becoming a teen parent or being convicted of a crime decline. “Delaying childbearing until you’re ready to be a parent is not just about improving your own life, it’s about giving your children greater opportunities in life,” Sawhill said. 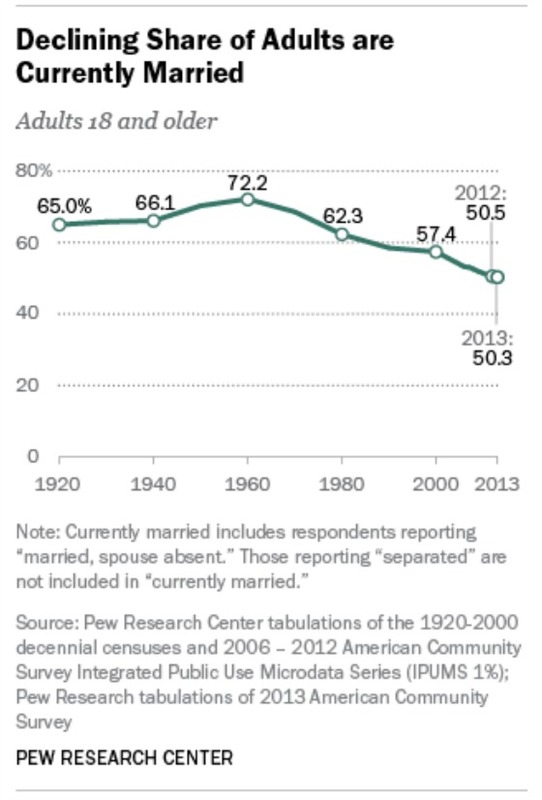 And with the educational gap between women and men growing, as evidenced by 32 percent of women having their bachelor’s degree by the age of 27 compared with 24 percent of men, we are of the belief at CWS that marriages will continue to be delayed. The reason is that we don’t expect the vast majority of college educated women to marry men without degrees. This could be construed as somewhat of a controversial opinion, but we only care about what happens and not what people think should happen. The biggest catalyst for home buying is having kids and with marriages being delayed and child birth taking place later as well, we believe this is very favorable for continued strong rental demand. 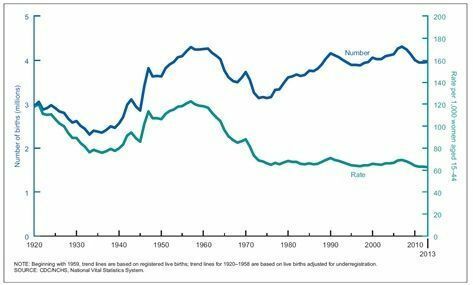 Finally, despite these trends, the overall number of births is still at a healthy number, which is also quite positive for having a relatively large pipeline of future renters over the next thirty years or so as the following chart shows. 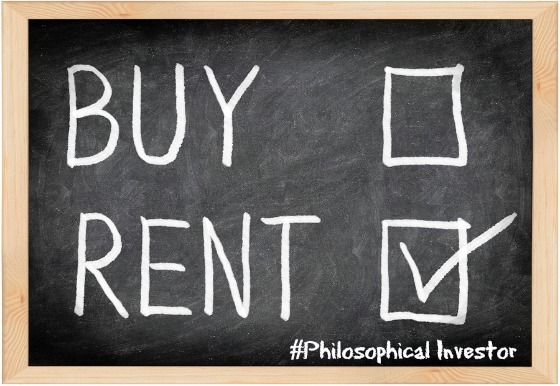 And while it’s true we have witnessed one of the strongest apartment investing cycles over the last five years that most of us can remember, we continue to believe that there are compelling reasons to remain bullish about rental demand for a number of years to come. The combination of delayed marriages, later births, more stringent loan requirements, and a growing population all combine to provide a powerful set of factors supporting apartment owners for a number of years to come.